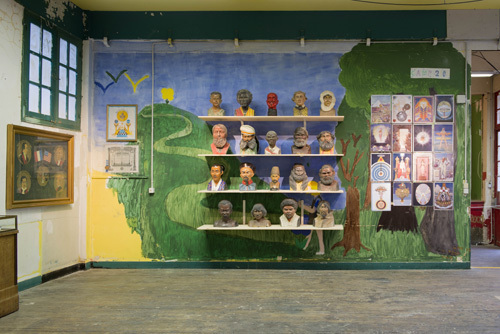 View of “Jim Shaw,” 2013. With “The Hidden World,” for which he was given carte blanche, the artist—known for working with everything from painting to performance—has created a breathtaking and expansive journey through the myths and beliefs of America. His collection of books, T-shirts, posters, banners, and postcards, even videos of people burning in hell, are displayed in a casual fashionon small, old-fashioned monitors, or as photocopies pinned to the unpainted wallsbefitting the material: most often found objects with visible signs of wear and tear. This presentation highlights Shaw’s hands-on attitude toward his collection. Here is material to be used, not simply revered, whether it’s a painting of a cross that also registers as a bridge over troubled water, an instructional image depicting a Mormon baptism, or a Scientology pamphlet showing the three stages of the game of life according to the movement’s ideology: beingness, doingness, havingness. The one-thousand-square-meter abandoned school that currently houses the Chalet Society couldn’t have been a better match for this didactic collection-as-installation.